By the time that Inglewood was getting started a lot of small communities in Ontario had already faded from prominence, including nearby Sligo. Inglewood got started directly from the arrival of two railways. To investigate this area, we left one car on Chingaucousy Road just north of Boston Mills Road where the Caledon Trailway (yellow below) crosses. A second car was taken to Ken Whillans Resource Management Area where there is free Trailway parking and access. The hike took roughly the green trail including wandering around in what would become Inglewood. A short trail connects the resource area with the former Hamilton & North Western Railway (H&NW) that was built through here in 1877. The Trailway crosses the Credit River on the same bridge that the railway once used. A close look at the H&NW crossing reveals several railway construction methods. Wood pilings can still be seen in the river from the earliest crossing. Cut limestone has been used for the abutments and a central pier that supports the current steel bridge. The upstream side of the central pier has been given a newer concrete facing and point to act as a spring ice breaker to reduce damage to the bridge. The Trailway heads west from here toward Inglewood. The railway junction was created when the Credit Valley Railway (CVR) arrived in 1878. The historical atlas above shows the junction as well as the woolen mills but the town was yet to get started. Early names for the community were Sligo and Sligo Junction but these name didn’t last because it had already been used in the area. The original Sligo had a post office which was located on Thomas Bell’s property a couple of concessions north. I’ve indicated the location on the map with an arrow. There was also a switchback on Centre Street (marked on the map) where a community named Sligo had once housed a population of 50. The name was changed to Riverdale but when the post office was opened a new name was needed and Inglewood was chosen. The two railway lines crossed on the west side of the street where you will also see the old General Store. Built in 1886 by George Merry it has an interesting and highly decorative chimney. The rear of the store housed a bake oven that outgrew the location and, after moving, supplied bread to the local towns until it was destroyed by fire in 1940. South of the railway junction is the railway hotel which now serves as a general store. It was built around 1881. The original industry predates the town and is still to be found on Maple Lane in the form of several stone buildings. A short laneway, lined with mature trees, leads to the mill. In 1834 the property was purchased by Thomas Corbett who built a dam, mill race and a small frame woolen mill known as Riverside Woolen Mills. A larger mill was built downstream a few years later so that the work of fulling and spinning the wool could be done in the mill instead of in the local farmer’s homes by their wives. In 1871 the mill was rebuilt in stone by Corbett’s son-in-law, David Graham. That building is seen in the photo below. Just four years later the building was gutted by fire and leased to Ward and Algie who rebuilt the mill. It grew and in 1890 the Grahams returned to running the mill. The building seen below was added by them in 1896. The head race carried water from the river to the mill to power the machinery. The Riverwood Mill raceway is an obvious trench that the local farmer now cuts for a crop of hay. The cover photo shows the raceway with the farmer’s old steel bridge allowing him access to his property on the other side. At the upper end of the raceway is a section of the river that has been protected with gabion baskets filled with rock. There are at least two phases of the gabion as a lower one is badly corroded. There are no signs of any original dam construction here. Inglewood is a good place for a short walk through town to observe some of its architectural heritage. The house below is in the correct place to be the David Graham house on the historical atlas above. The Cultural Heritage Landscapes Inventory suggests that it could be his home. If so, it predates the building of the village. This five-bay, one and a half story Regency Cottage has the elaborate doorway and large ceiling to floor windows that were popular between 1810 and 1840. If this is the original Graham house, as it appears to be, then it contains a mystery. It faces Louise Street and not 1st line west (McLaughlin Road) as one would expect. This house is also on David Graham’s property and dates to around 1870 making it contemporary with the mill and not the town. There is a stone building behind this house that was most likely used by workers at the mill. The Methodist Church was built in 1889 with a grand opening in 1890. The Graham family was a key employer in the town and was also instrumental in the construction of this church building. In 1925 the Methodist Church merged into the United Church. This building is interesting in that it has a weathervane instead of a cross. The Trailway continues west out of Inglewood to where it crosses Old Base Line. Continuing, it passes through The Caledon Golf and Country Club. Near Chingaucousy Road you will see a series of decaying chalets that used to belong to the country club. They have been described in greater detail in a post called Caledon Country Club Chalets. The historic town of Inglewood and the Caledon Trailway make a great place to explore. This entry was posted in Credit River, Uncategorized and tagged Caledon Golf and Country Club, Credit River, Credit Valley Railroad, Hamilton Northwestern Railway, Inglewood, Riverdale Woolen Mill on December 7, 2016 by hikingthegta. The Caledon Trailway crosses Duffy’s Lane (6th Line) north of Patterson Sideroad (25th Sideroad) on a bridge used by the Hamilton & North Western. 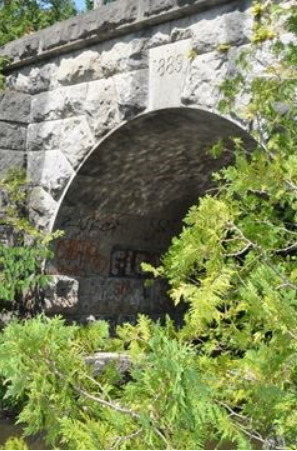 Palgrave resident Jack Gibson told me that the stones for the bridge abutments are the sames ones used to build the 1889 culvert over the Humber River. 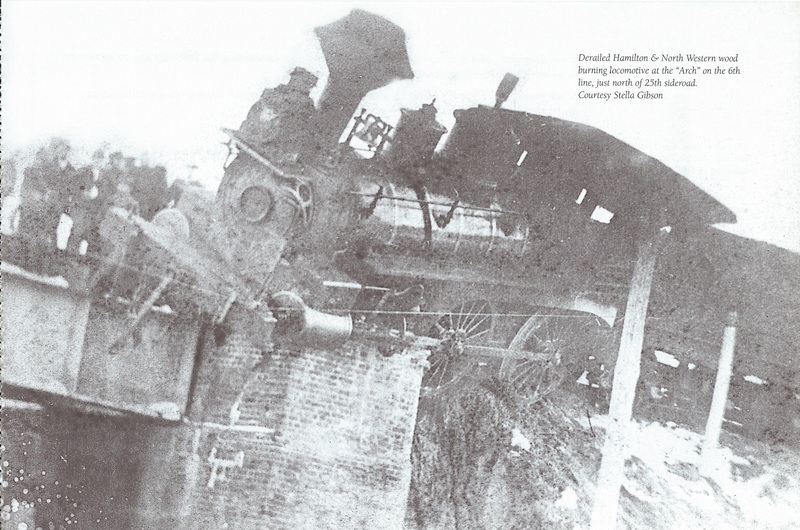 The bridge was the site of a derailment, the date of which I have been unable to determine.